Quinnipiac has released this month’s poll for the Connecticut Senate race. 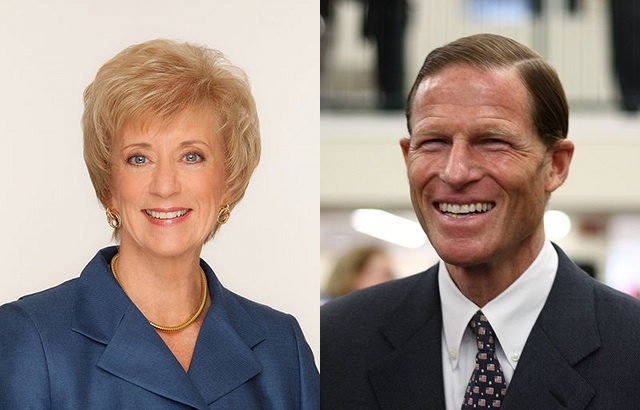 Now we turn to those who say Rasmussen’s “House Effect” is repsonsible for Democrat Richard Blumenthal’s surprisingly weak leads against Republican Linda McMahon, because Quinnipiac has the race even closer than Rasmussen does. Again, in some states 51-45 (MoE 3.3) would be a bad and troublesome result for Republicans, or a good and promising result for Democrats. But Blumenthal earlier this year was ahead of McMahon by over six times that in the Quinnipiac poll. So when Rasmussen had the race in single digits, at Blumenthal +7 and now +9, the usual suspects said Rasmussen was biased. But now Quinnipiac has Blumenthal up only 6, the closest result since one Rasmussen outlier in May. From that poll I calculate it to be an 81/19 race in Blumenthal’s favor, as the small Margin of Error leave less doubt. But for McMahon to have closed from down 41 in January to just 6 now is noteworthy.